From the glass globes hanging from beams on the barn-wood living room ceiling to the 33-inch stainless steel farmhouse apron sink in the kitchen to the glass garage doors welcoming outside in, designer David Latimer likes to make a statement. And he does it all in about 300 square feet. The founder and CEO of the Nashville-based New Frontier Tiny Homes says he truly believes less is more. Recently featured in Architectural Digest, Latimer’s tiny houses on wheels have the kinds of finishes found in much more expensive homes. In the Alpha tiny home, which retails for about $95,000 and was featured on HGTV, the kitchen has granite counter tops, subway tile backsplash, stainless Fisher Paykel dishwasher drawer and a smooth cooktop. Cabinets fold down from the ceiling and back up when not in use. The drawers have nickel hardware that serves as locks, securing the drawers when the homeowners decide to hit the open road. The kitchen is elevated on a platform, which cleverly hides an 8-person custom dining table with bench seating and serves as storage. Floor-to-ceiling windows on both sides make the space feel far larger than its 240 square feet. 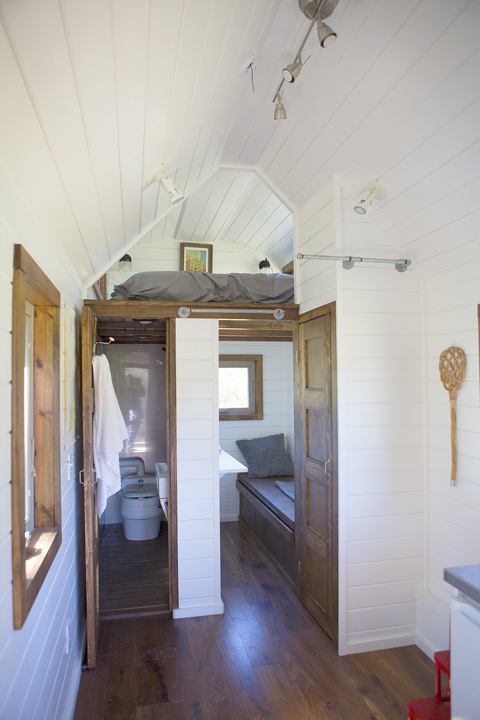 The bathroom, complete with composting toilet, has a full-size tub with shower and an all-in-one washer/dryer. The loft-style bedroom, accessed by a ladder, accommodates a king-size bed. A large wooden cabinet incorporated into the design of the exterior of the tiny home accommodates propane, electrical wiring and a hot water heater. Spencer Wright and wife Bela Fishbeyn bought one of Latimer’s homes, a customized version of the Alpha, and plan to live in Northern California with their 8-month-old daughter, Escher. Fishbeyn says while the idea of minimalism and reducing their carbon footprint is appealing, the aesthetics of Latimer’s homes were what convinced the couple to actually make the purchase. Wright agrees: “I think for people of our generation, those (minimizing waste and living green) are very comfortable concepts. You don’t have to be part of a movement anymore to think those things are important. “For us, we’re trying to build the perfect house for us. David Latimer, CEO and founder of New Frontier Tiny Homes sits in one of the homes at the build site. Fishbeyn is managing editor of The American Journal of Bioethics at Stanford University, and Wright is a stay-at-home dad. Because Fishbeyn is able to do much of her work from home, the couple is not concerned with commuting time and plan to live off the grid in the Santa Cruz Mountains. They already have invested in installing solar panels in their home, slated to be featured on HGTV. Wright says Latimer offered to name the home after them, and they’re considering the name Escher, which Wright says has a nice double meaning. It would be their daughter’s namesake and gives a nod to the Dutch graphic artist M.C. Escher, the master of thinking outside the box. Their home, which is a few hundred square feet larger than the Alpha, will come complete with ceramic slab countertops and wall art by 1767 Designs, a Nashville artisans company which specializes in repurposing old wood from homes and buildings around town. Between shows like HGTV’s Tiny House, Big Living and FYI’s Tiny House Nation, the tiny home phenomenon has really gained momentum. 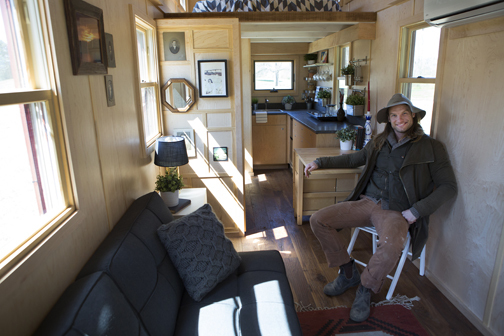 Latimer, 34, calls it a “social movement.” While he has always loved design, it wasn’t until after some serious soul searching that he found his passion in tiny homes. 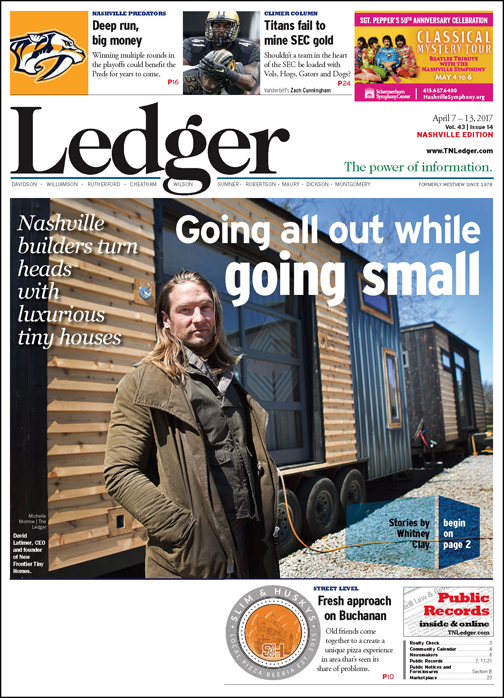 His father, Eddie Latimer, founded Nashville’s oldest non-profit housing development corporation, Affordable Housing Resource Inc., and the two discussed at length the idea of tiny homes as an affordable housing option. After spending several years working for Ralph Lauren and Earnest Sewn in New York, Latimer left the city for an opportunity to build an orphanage in Uganda. He eventually returned home to Nashville and tried his hand at restaurant ownership before finding his calling. The journey that began in 2014 started taking shape last year. He partnered with builder Zac Thomas to form New Frontier. Soon they were getting some serious buzz. Don’t like your surrounds? New Frontier Tiny Homes are built on mobile platforms that allow owners to find new locations. Like Latimer, for many advocates, tiny homes are far more than their square footage. They offer an option to living on credit and are an antidote to an obsession with acquiring things, many of them meaningless, says Sarah Murphy, who heads up the state chapter of the American Tiny Home Association. “For the most part, we as Americans not only buy or build these giant houses that have all this closet space and then fill them with stuff we only maybe sometimes access, we’re also going and opening storage units for a couple hundred bucks a month that are heated and cooled so all this stuff doesn’t warp or whatever,” Murphy points out. Before moving to Nashville, Murphy, a graduate of Cornell University, where she studied hotel and restaurant management, was living in Washington, D.C. with her husband, John. The couple had a custom tiny home built and moved to Nashville before realizing that finding a place to put it, where it would comply with codes and zoning regulations, was going to be a huge obstacle. Instead, they parked it behind their house in East Nashville and decided to become a tiny home advocate. It is Illegal to have a tiny home on wheels in Davidson County. While out of the leasing business, Murphy continues to be a fierce advocate for tiny living. It holds an appeal for a lot of prospective home buyers, particularly potential first-time purchasers daunted by the thought of a decades-long mortgage. Cody Hazelwood, 27, who’s familiar with Latimer’s homes, said he and his fiancé would like to purchase a tiny home one day but are stymied by the zoning and codes hurdles. If the prospective homeowner doesn’t plan to pay cash, financing can be another hurdle. Most traditional banks don’t offer mortgages for tiny homes, although there are limited avenues, such as LightStream, a division of SunTrust Bank, which does offer loans for tiny house buyers. This tiny house can accommodate a big bed – a king-size bed, to be exact – in a loft accessible by ladder. As appealing as tiny living may be, for those trying to downsize from even a 1,000-square foot apartment to a tiny home, it can be quite an adjustment. Wright and his wife have been going “lease-less” for about a year-and-a-half, in anticipation of moving into their tiny home. They were moving every couple of months to help keep extraneous purchases to a minimum. Both Latimer and Murphy recommend the book, “The Life-Changing Magic of Tidying Up’’ by Marie Kondo. The Japanese organizing consultant followed up her New York Times #1 bestselling book with “Spark Joy,” the message of both being to only keep what sparks joy. 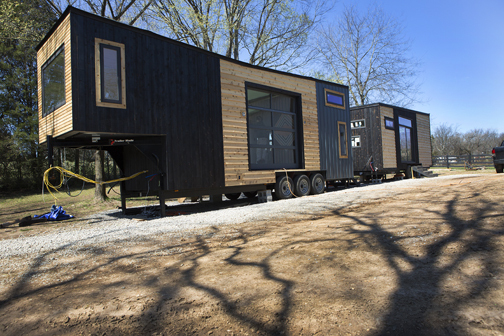 One way to take a little test drive is to check into Live a Little Chatt, a new tiny home hotel at the foot of Lookout Mountain in Chattanooga. Latimer plans to send one of his homes there so guests can experience at least staying tiny, even if they’re not ready to live that way. Visitors can book tiny homes with names like Shangri-Little and Wandering Gypsy for about $125 a night. Murphy concedes that tiny houses aren’t for everyone at every stage of life, but she says the tiny home’s message of minimalism has universal meaning. If it encourages people to rethink the urge to acquire for the sake of acquiring and look to experiences rather than things to enrich their lives, then that’s half the battle. “We’ve given ourselves so much to worry about,” Murphy adds. “I think that’s the benefit of the tiny house movement and minimalism is bucking these stereotypes. “If it (downsizing) feels right to you, then keep pursuing it, keep getting a little bit better at it, but know why you’re doing it too” Murphy adds.